There have been huge improvements and investment here recently in the vineyard (which is planted 75% Merlot, 25% Cabernet Franc) and chai by former manager John Kolasa and owners Chanel. The Chateau itself has recently enjoyed a substantial make-over. This is a great property that made fabulous wines in the past but dipped in form during the 1990's until the new regime took over. It is now right back up there as one of the very best of all the Saint Emilion Chateaux. New director Nicolas Audebert came in from Krug via South America and had an amazing start to his career at Canon, conjuring up the near-perfect 2015 vintage and an outstanding 2016. One of the hottest properties in Bordeaux right now thanks to fantastic quality and reasonable en primeur pricing. The 2017 Canon was picked 4 to 21 September and 22 to 27 September for the Merlot and Cabernet Franc at 42hl/ha and matured in 56% new oak. There is 14.0° alcohol this year and the pH comes in at 3.66. This takes a little time to open, eventually revealing blackberry, briary, crushed stone and light iris scents. The palate is medium-bodied with very fine tannins and good backbone. Strangely, it reminds me a little of modern-day Figeac, that Cabernet component smaller here but very expressive with touches of graphite and flint towards the linear but beguilingly fresh finish. I like the manner in which the limestone shines through the wine here, something noticeable in recent vintages. Whilst not the sensational 2015 or 2016, it is a damn fine Saint-Émilion that will settle at the top of my banded score. Drink 2022-2045. 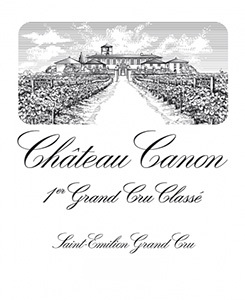 The deep purple-black colored 2017 Canon offers-up intense notes of crushed blackberries, black cherries and warm cassis with touches of fertile loam, yeast extract, beef drippings and iron ore plus a waft of garrigue. Medium to full-bodied with great freshness and firm, rounded tannins, it's very earthy in the mouth, finishing long and mineral-laced. A very serious wine, it is also fun, bright and vivacious and should age impressively. Pretty dark crimson. Lightly toasty nose with some floral notes – pretty ! Not forced but with some rigour. There’s a little note of sweet oak here but it should dissipate. Good balance. A more serious, complete 2017 than many. No frost here on the plateau of Saint Emilion so the yield was a healthy 42 hl/ha. The encepagement this year will be 77% Merlot, 23% Cabernet Franc with 18 months in 56% new oak. The harvest took place from September 4th to 21st. A deep ruby colour, with enticing black plum and morello cherry supported by subtle fresh vanilla and a light smokiness. Most impressive on the palate is the cashmere texture from impossibly refined and supple tannins. The fruit glides over this velvet support, with glistening ripe cherries and fresh blackcurrants. Acidity cuts through the ripe fruits and adds a savouriness to the sweet smoke from measured use of new oak. Elegant, poised and precise, with a lingering finish. Another successful year for Canon; not as voluptuous as in 2016 or 2015, but it has a wonderful salinity and a crisp, fresh curl to the fruit. They aim for crystalline flavours, vibrant fruit and a sense of forward motion, and for me it has that again this year. The flavours of blueberries, blackberries and soft, smoky almonds are drawn out through the palate, and by the time it has finished you are ready to go again. It has an austerity that is overridden by the juice, not quite overriding the vintage, but it's a delicious wine that again showcases the beauty of limestone. 50% new oak. Thomas Duclot is consultant here, and it really is a great year for the estates that he works with. Lovely and relaxed on the nose, with oak and fruit in harmony, this is a good wine, but it is slightly spoilt by a green edge on the finish and overly austere tannins. I would like it to be so much more refreshing and silky but the attack of dryness and grainy tannins rather shuts it all down. Given the reputation of this Château I am confident that it will even out, but this will always be a wine with a bitter edge.